Hue beef vermicelli soup (Bun Bo Hue) is a very famous dish in Vietnam. It is not simply a dish to serve but a huge pride of Vietnamese people when it comes to Vietnamese food art. 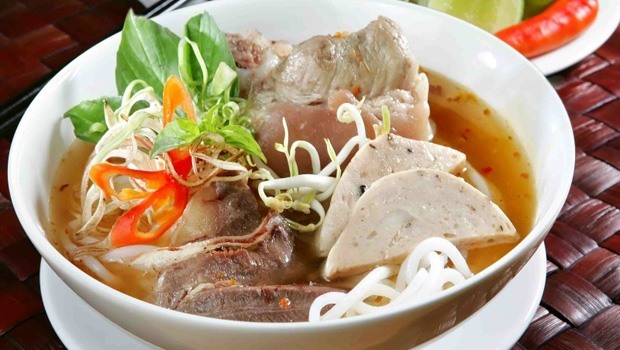 Hue beef vermicelli soup was mentioned in the list of top most delicious food dishes all over the world. Anthony Bourdain – a very famous chef cook in the U.S had chance to enjoy this dish in Dong Ba market in a trip to Vietnam, and after tasting this soup, he exclaimed that: “this is actually the best soup in the world”. 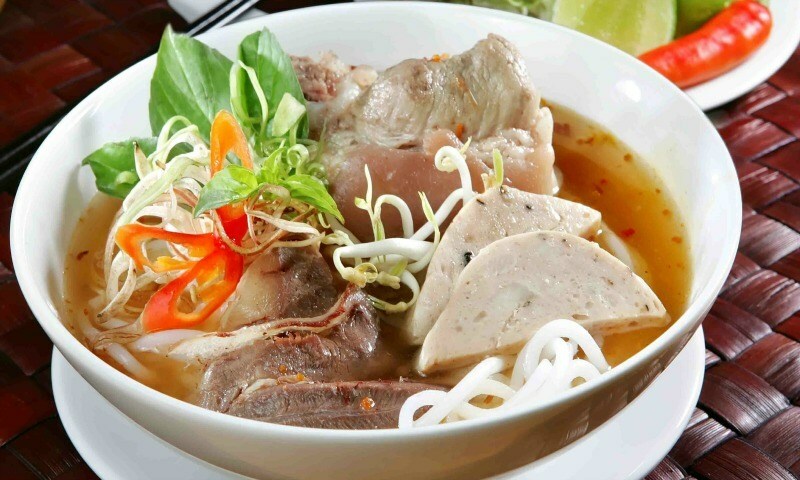 Hue beef vermicelli soup is a pride of Hue – an ancient capital of Vietnam, located in the Central part of the country. It is not only famous and popular in Vietnam yet is also enjoyed and highly spoken by many experts from famous magazines, channels, by foreign tourists and even famous cooks coming to this country. Hue beef vermicelli is a soup cooked mainly with beef, pork leg, and a special sauce that you can find just in Vietnam. However, do not concern about it because I will give you the replacement if you cannot buy this sauce in your local markets. Besides, this soup is also very good for people after working out or those suffering from iron deficiency. The sweet and fresh taste of this soup will wake up every taste bud! 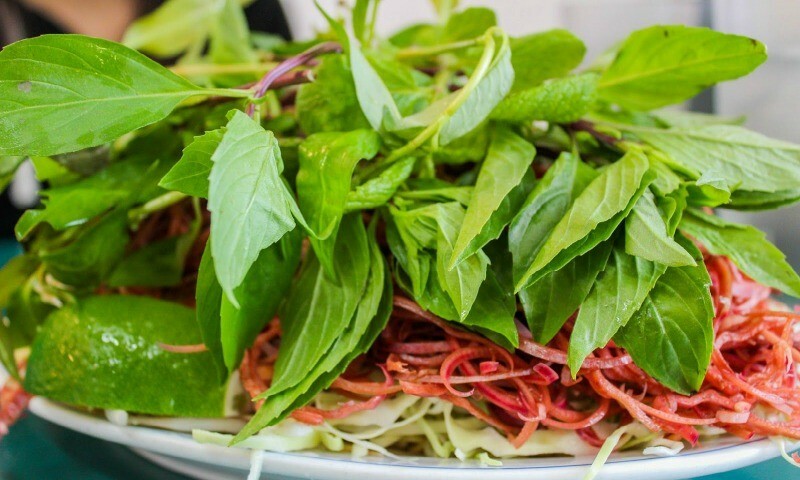 If you are one of people who love Vietnam food and want to try this but still not have chance to come to this country, this writing will be here to help you out. Just prepare some ingredients on the list below and follow the steps we listed with details, and you will be able to enjoy this world’s most delicious soup right at the comfort of your own home with family and friends. This soup can be served for every meal of the day. It is especially suitable for breakfast, and this is also the breakfast dish that many Vietnamese people enjoy. 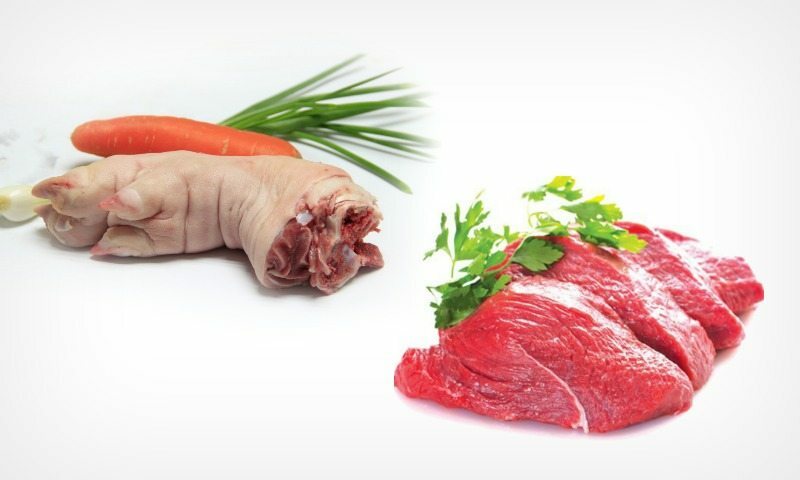 In Vietnam, pork leg and beef are often very fresh, meaning that they do not contain preservatives and are not frozen like in many other countries. 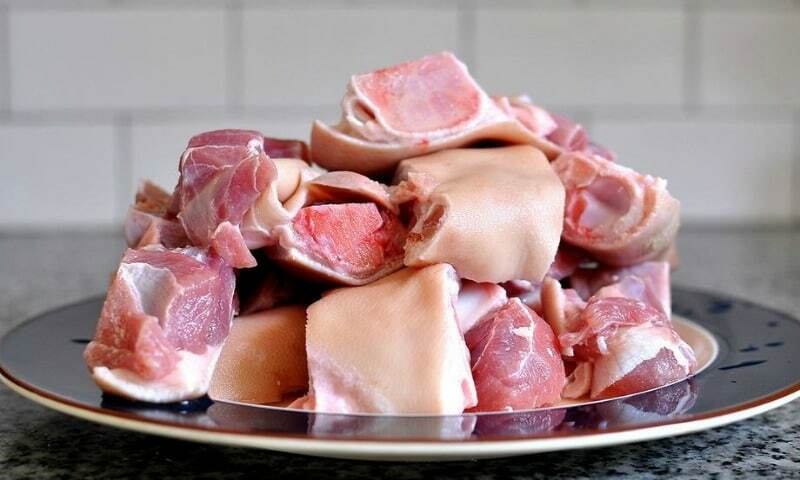 – Pork leg: if you live in a region where pork are just sold in supermarkets in forms of sealed products wrapped in plastic bags or frozen items, you should opt for hind pig legs because the bone of the hind legs would be smaller and the skin is thinner. For Hue beef vermicelli soup recipe, you should choose those pig legs weighting about 500-600g per leg with tight flesh. – Beef: opt for fresh red beef with thin tendons and bright yellow fat. Avoid choosing damp beef. Press gently to check the elasticity. Opt for the beef with good elasticity. – Wash the bone, beef, and pig leg well about 3 times with salt and clean water. Remove dirt and cut the bone into 4 -5 cm long pieces. Cut the pig leg into 2 – 3 cm long pieces. You can also soak the bone in diluted salt water in 1 hour to wash out all dirt inside the bone. 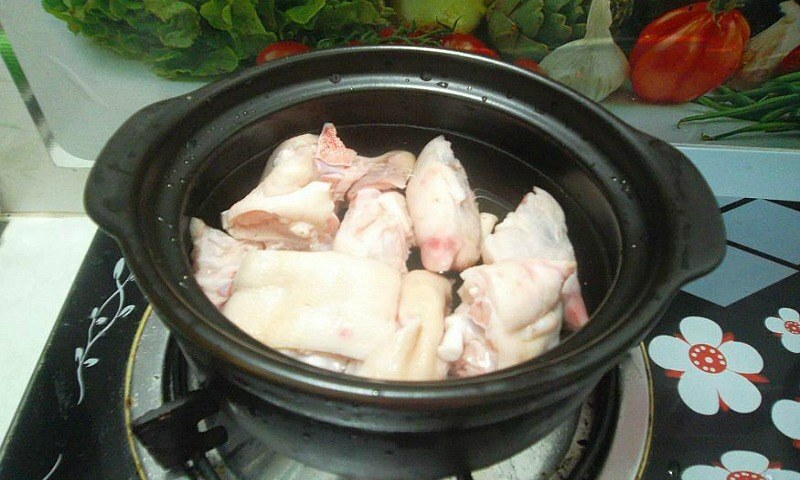 – Prepare a large pot, put the bone, the pig leg pieces, and the beef into the pot and cover with hot water. Add some salt. Over high heat, boil them for about 5 minutes. When the water is boiling, take the bone, the beef, and the pig leg out and wash again with plain water. You can repeat this process 2 – 3 times if you want to remove all dirt, but just do this with the bone, not the pig leg and the beef. – Marinate the beef and pig leg with 2 tablets of spice for beef vermicelli soup (you should mash them and mix with some hot water to dissolve). Let it stand for 1 hour. If you have Hue shrimp sauce, you will need to mix 1 – 2 tbsps of the sauce with some cold water, let it stay for a few minutes and just use the liquid, discard the residue in the bottom. You can use a sieve to do this step. Marinate the beef and pig leg with this liquid. Add more salt if needed. – Grill the shallots till fragrant. Remove the peel and wash them clean. Beat and press the lemongrass. Tight together. Peel off the large onion and cut into 6 – 8 pieces. – Wash the veggies, cut the roots and discard the old leaves, set aside and let them dry on their own. If you have banana flower, slice it thinly and soak the slices in water mixed with vinegar and salt. 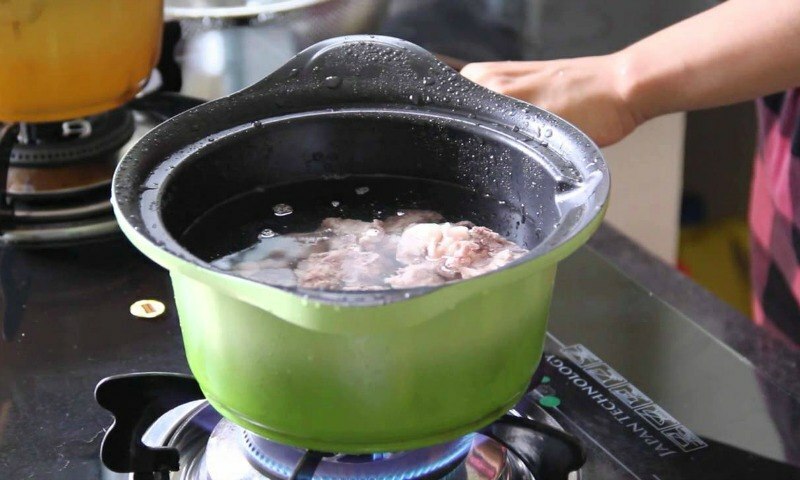 – Put the bone and pig leg into a pot and pour water to cover 2/3 the pot (adjust the broth to suit 4 servings). Add some salt and turn on the heat. Heat the pot over low heat and skim. Add large onion, lemongrass, and shallots into the pot and simmer for about 45 minutes. When the pig leg turns to soft, add the beef into the pot and keep simmering till all ingredients are cooked and soft. Take out the beef and cut into very thin slices. 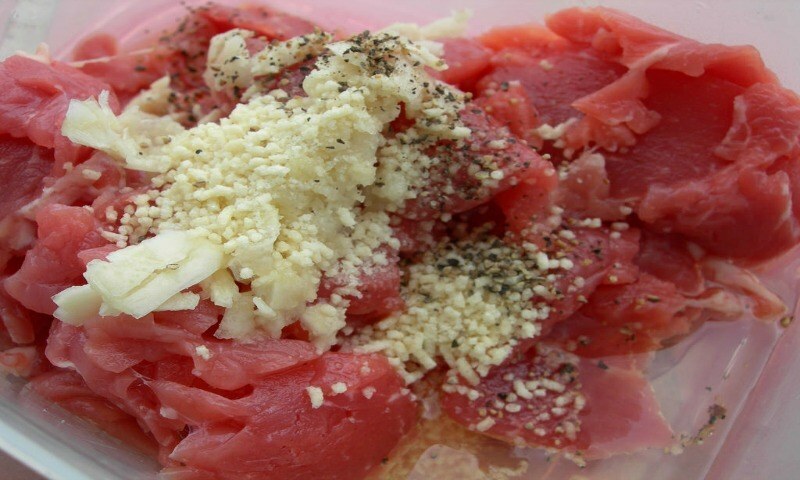 Do not cook the beef for too long to keep its natural sweetness and crunchiness. – Taste the broth and add some salt, rock sugar or beef vermicelli spice if needed. If you cannot buy even the instant spice for beef vermicelli, you can cook the broth with shiitake mushroom and white beet, and fresh shrimp instead. – If you want to get more attractive color for the broth, you can heat some cooking oil with finely chopped garlic, shallots, chili paste (or chili powder), and lemongrass. Stir quickly and pour the mixture into the broth pot. – Arrange fresh vermicelli, sliced beef, pig leg, chopped scallion, and sliced large onion in a large bowl. Pour the boiling broth into the bowl to cover all ingredients. Serve the soup when it is very hot with fresh, raw veggies and chili paste. – The soup needs to smell very fragrant; the taste is fresh and sweet with attractive color. The beef is crunchy and sweet, and beef slices must be thin and not overcooked. The pig leg should be soft and fatty. Serve right away with raw veggies to enjoy the wonderful taste of the soup. Optional: Vietnamese people prefer serve this soup with boiled pig blood and Hue pork roll slices, so if you have these ingredients, you can add them to your bowl and enjoy. The Hue beef vermicelli soup recipe today is not a very easy dish to make. It requires a little carefulness, meticulousness, ingenuity, and patience, and especially the big love to Vietnamese food. If you are really interested in this wonderful traditional soup, then follow exactly the steps we listed above. This dish can be served as any meal of the day and your family will love it! Thus, what are you still waiting for? Let’s try it and feel!